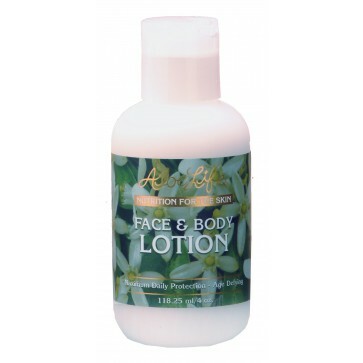 Face and Body Lotion feels like silk on the skin and was formulated for all skin types - especially sensitive and damaged skin. Nutrition for the Skin is free of common rancidity found in many lotions that can age skin, children and adults receive protective factors called antioxidants, minerals, amino acids and herbal extracts. Non staining light Moisturizer for men, women, and children. Concentrated no water added. Face and Body Lotion feels like silk on the skin and was formulated for all skin types - especially sensitive and damaged skin. Nutrition for the Skin is free of common rancidity found in many lotions that can age skin, children and adults receive protective factors called antioxidants, minerals, amino acids and herbal extracts. Formulated for all skin types the emollient base of Lanolin, Macadamia Nut Oil and Jojoba oil blended with Vitamins A, C, E, Selenium and Zinc soothe, lubricate, protect and moisten the skin likened to the body's own natural oils.The natural grapefruit scent is non irritating great for men and women and it works wonderfully on very sensitive skin, even babies! Studies on herbs have supported the protective and skin regenerative properties of the herbal extracts Chamomile and Whole Leaf Aloe Vera when applied to the skin. Does not contain Parabens! Priced well - it is the best value formula with quality ingredients no water added for head to toe. Very popular try it you will love it. Gluten Free!